It's been a long time since I last posted on JAA. I didn't intend to stop blogging. I just needed, for a couple of months, to devote most of my energy to sorting something out, something I wasn't expecting to have to sort this year. So just like a log rolling off a truck as it trundles along a twisty lane my blogging fell by the wayside. By the time said something was sorted I was out of the habit of posting on JAA. Time meanwhile tick-tocked its merry way along the path to infinity and now five months have passed since I last put up a blog post. This isn't a proper post but I feel if I don't write something before we all jump over the great-wall-of-China divide between one year and the next I might never start blogging again. I will be back properly in the New Year but given this year's form posting may be sporadic. In the meantime I would like to wish you a happy and peaceful Christmas. Or if you don’t celebrate Christmas Happy Holiday. Thank you so much. Many happy returns. Thank you Debra and you too have a lovely Christmas and a wonderful 2016. Welcome back and a very Happy Christmas to you. Good to see you again, I was thinking about you the other day. Hope you sorted it out and that your school/photography is progressing nicely. Happy Holidays, Merry Christmas and all the best to you in 2016. Blogging takes a back seat sometimes. My blogging has had to sit there quite a lot this year. But it’s lovely to see you whenever you can make it. Blessings of the season. Are you still doing the photography course? Wonderful to see a post from you B! Glad to hear that you were able to sort things out 🙂 Life always throws us twists and turns. Here’s to a very happy holiday season and New Year. Many Happy Returns. Always lovely to read JAA. Look forward to more in the New Year. So glad you are back. You have the most wonderful style of writing – it is so visual. With a talent like that you are duty bound to continue to share that gift! Update: Oops! Just saw your lovely card, thank you. Love to everyone for a very Happy Christmas. It was lovely to see this pop up in my email notification feed. Brought back happy memories of gloria and ever such a nice cup of tea in Dublin. You’ve been missed B, welcome back if only for a little while. Merry Christmas. Thank you Karen. I hope your Christmas Day is going splendidly. Just wanted to stop back by to wish you all the best in this new year. Thank you Karen, that’s kind. And I wish you a happy 2016. Thank you Carol and wishing you a very Happy New Year. I am sorry for the delayed reply. Welcome back 🙂 hope you had nice christmas. wishing you a very happy new year! Thank you Tomomi. I hope you had a lovely Christmas and a very happy new year to you too! Delighted you are back on air again,really missed your beautifully written blogs. New year and a new start, let’s hope 2016 will be an amazing year for all. Aw, thanks Ann, that’s lovely. And amen to an amazing 2016 for all, let’s, as you say, hope. Hello B.! So nice to hear from you! 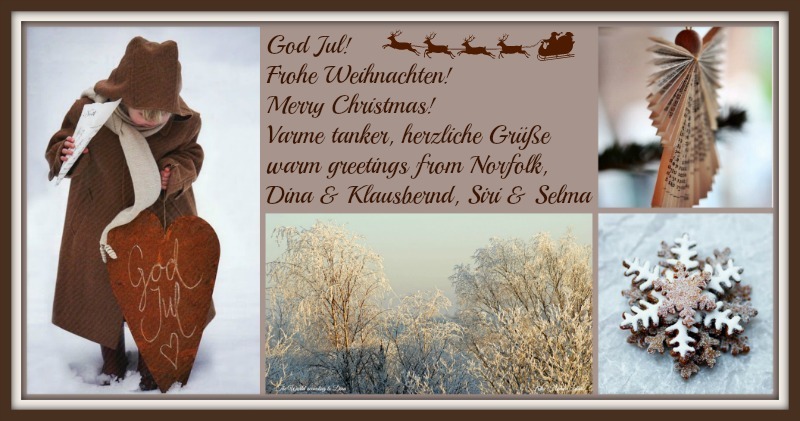 I hope you had a wonderful holiday season and I wish you all the best for a wonderful 2016! Yes I had a good holiday season and I hope that you Stefano and ‘her majesty’ had a lovely time over the Christmas period.